Masters of the Universe Classics Pre-Order from Super7 Begins May 5th! Super7 is excited to announce the pre-order for the next wave of the Masters of the Universe Classics action figures! The line of deluxe 7-inch action figures continues with four brand new characters, sculpted by The Four Horsemen. 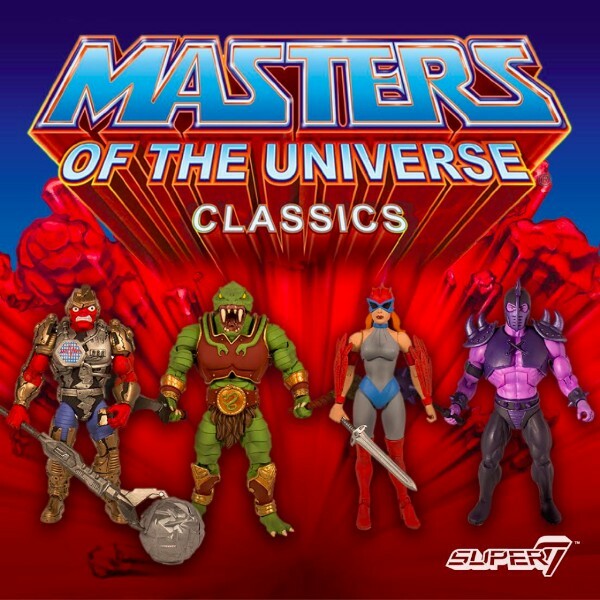 The MOTU Classics pre-order for Quakke, Fangor, Hawke, and Lodar will start on Friday, May 5th at Super7Store.com. Stay tuned for details on pricing and ordering information. Join Pixel Dan for a look at the 2015 MOTU Classics Chase Figure: Spirit of Grayskull! Join Pixel Dan for a look at the upcoming Snake Armor He-Man and Battle Armor King Hsss 2-Pack from Mattel! Join Pixel Dan for a look at the upcoming MOTU Classics Ninjor figure from Mattel! Join Pixel Dan for a look at the MOTU Classics Arrow from Mattel!